Your hamsters will LOVE this delicious hamster treat! Step 1: Fill the dish halfway with the crumbs of regular hamster food. There is usually a lot at the bottom of the bag. Step 2: Scatter some of the small bits of hamster food into the dish. Step 3: Cut 4 Yogies into four pieces, and scatter them in the dish. Step 4: Smash some Fruit Bites with your fingers, and sprinkle them in the dish. Step 5: Sprinkle on some sesame seeds. 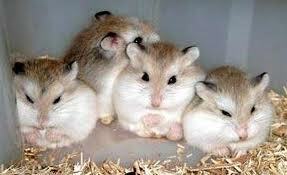 THIS IS FOR HAMSTERS ONLY!!!!!! DON'T FEED THIS AS EVERYDAY FOOD BECAUSE THE YOGIES ARE HIGH IN FAT, AND FRUIT BITES ARE TREATS!!!! !